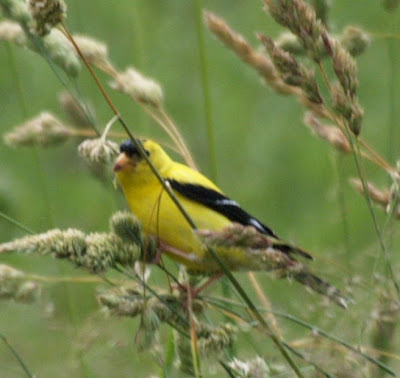 This yellow clad visitor to Crammond, along with a friend, was eying off the ripening local saskatoon berries last week. I believe most of us should have received a form letter in the mail from the Alberta Electric System Operator (AESO) regarding additional electric power lines between Edmonton and Calgary. Two 500 kilovolt direct current lines are proposed, one through the western part of the province and one further to the east. And Alberta's electricity consumers get to pay for these lines, as part of our monthly billing. The question that comes to mind is: Do we need all that extra electricity here in Alberta, or is most of it designed to go elsewhere? In their mailed out document the AESO says that people encountered in their public consultation told them to "think big" so as to avoid interrupting peoples lives with more transmission lines later on. I wonder, who told them to think big, Alberta consumers or power exporters? 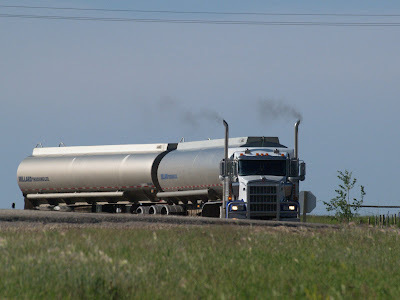 It would be very convenient for exporters to have a freely provided highway for their energy going south, wouldn't it? We pay for their highway. Another suspicious element in this whole picture is an old "friend" of mine, Bill 19, which ensures that any meaningful public opposition to projects like the new power lines can result in jail time for those that oppose them. In fact, the AESO document brags that this legislation was introduced by the Government of Alberta on June 1st. to pave the way for their projects. And I distinctly remember that government MLAs strenuously claimed that Bill 19 was for ring roads around our large cities. 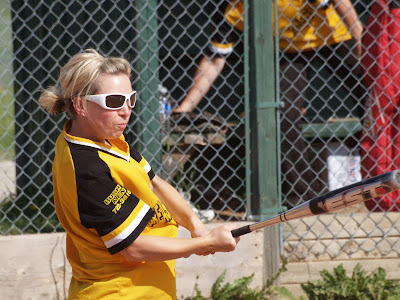 It goes to show you just how far down the hole the Stelmach Government has sunk. They simply say what they are being told to say by the bureaucrats that are working on behalf of Big Energy. That is what it boils down to. to the same people so as to help them develop carbon capture technology. I wonder what board positions have been promised to him after he leaves public office? How long are you prepared to put up with these pension seeking politicians that have sold their souls to Big Energy? This crop of hay is probably one of the better ones in the area, given all the dry weather that has prevailed during spring and early summer. Deep rooted forage species, such as alpha alpha, are at a distinct advantage this year as they are able to access soil moisture that is not available to more shallow rooted grasses. 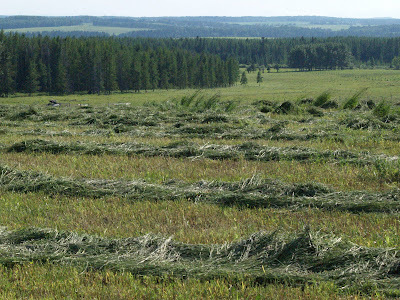 One Arbutus area farmer commented that his hay crop would be approximately 50% of normal this year. However, he held out good hopes for his oats due to the recent rainfall which amounted to 2 inches (50mm) in the Crammond area. 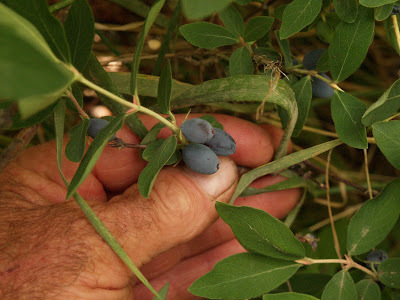 These berries, that look like elongated blueberries and grow on 4'-5' bushes, have been imported from Siberia by the University of Saskatchewan and propagated by an Alberta based nursery. The name "honeyberry" is somewhat misleading as the taste is quite sour and tart. However, they are great for jellies and jams. 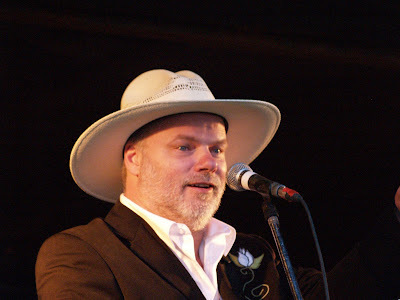 Veteran Canadian singer/songwriter and storyteller Fred Eaglesmith had a captive audience on Grandview Stage, southwest of Rocky Mountain House on Tuesday, July 14. 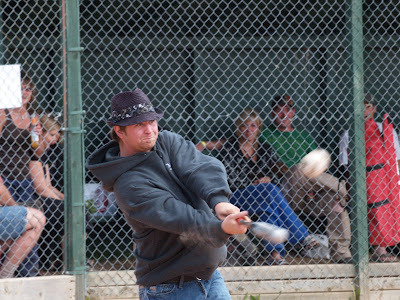 The informal lawn setting, mosquitoes, and unfulfilled threat of showers, fitted right in with Fred's style: He is a somewhat irreverent commentator on the status quo, in both prose and song and his followers are self proclaimed "FredHeads" (rhymes with "deadheads"). Just copy and paste the above YouTube address into the address bar on your web browser. 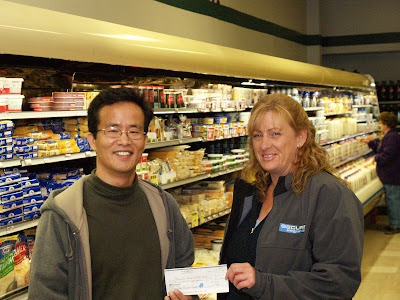 Owner of the Pioneer Store in Caroline, Ben Choi, presented a cheque for $685 to Caroline Clearwater Boys and Girls Club representative Rachele Peters. 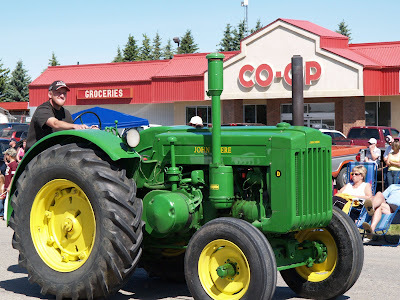 The money comes from the AG Foods Community Rewards Program and were earned by the Clearwater Boys and Girls Club from a sale of hot dogs and soft drinks outside the store on the May Long Weekend. The intersection between highways 22 and 54 east of Caroline has claimed its share of victims over the the years. 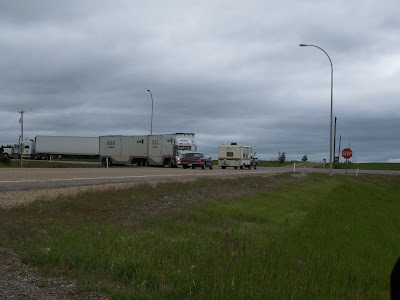 Traffic coming from the south (from where the camera is positioned) on Highway 22, which enters the intersection, like the camper in the photo, is very vulnerable to high speed traffic from the west, hiding behind a large vehicle such as the B-Train seen turning south on Highway 22 in the photo. A turning lane is needed for vehicles like the B-train, that bypasses the intersection itself. This is exactly what has been done with the intersection between highways 22 and 11 east of Rocky Mountain House. It is only a matter of time before more people are maimed or killed in this intersection. For a better look, please click on image to enlarge it. into the town after an absence of many years. And one of those towns was Rocky Mountain House. been a change in public opinion. and beverage thirst. So, it's a double whammy for Rocky bar owners. 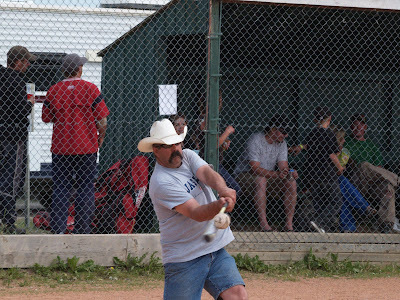 advantage of the bar owner and the Government of Alberta. public was bought off by directing some of the funds towards non profit organizations and public enterprises. recipients of gambling monies, and those that get fleeced providing it. petition. They can argue that the recession is hurting them badly. The question is, how does the recession affect the problem gamblers? 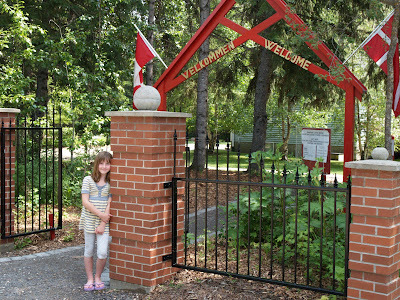 The Sundre Museum is a choice destination for summer visitors to the area. 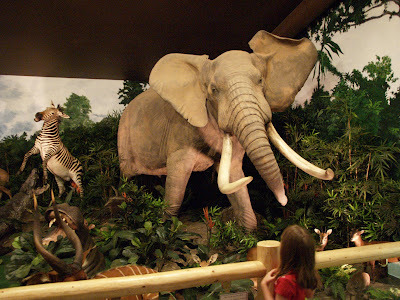 The Chester Mjolsness World of Wildlife display at the museum is of world class quality and has been featured in the main stream North American media. 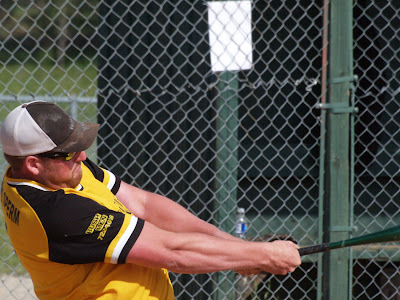 Chester, who was raised on a farm in the Sundre area spent his working life in the sawmilling business as the owner of the Spray Lakes sawmill near Cochrane. Following his retirement, he hunted around the world and decided that he would like to share his experiences of his world wide travels, along with his collection of trophy animals, with the general public. Chester has travelled extensively to Australia, New Zealand, China, Mongolia, Russia, Iran, Spain, USA, Canada, South Africa, Botswana, Zimbabwe, Namibia, Cameroon. He has hunted every continent except South America and Antarctica. The extensive display of his trophy animals is featured in a special building attached to the Sundre Museum. 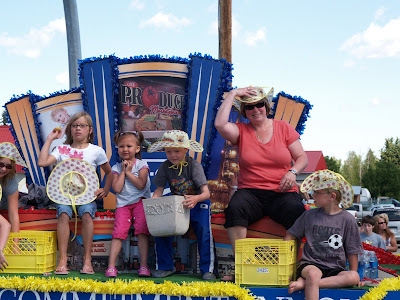 The museum murals were painted by Lorraine Hughes of Sundre; and the museum was both designed and created by Povl and Bibianne Munksgaard of Mountain View Taxidermy Ltd. of Olds. 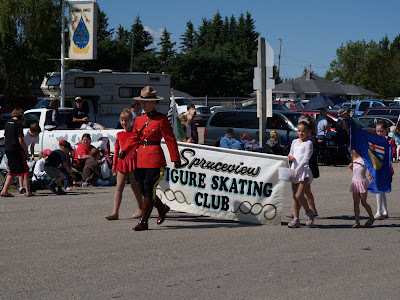 The Sundre and District Historical Society website is www.museum.sundre.com. 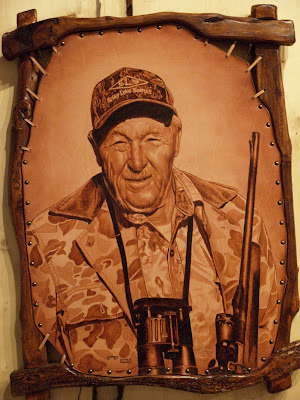 This leather relief portrait of Chester Mjolsness is displayed on the wall of the wildlife display center at the Sundre Museum. 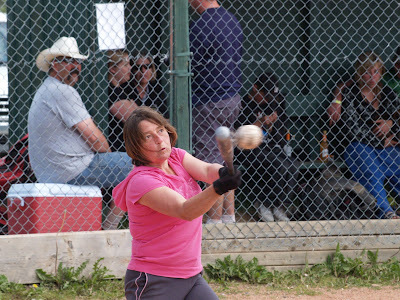 The Community Center in Sundre was packed with several hundred people last Tuesday, July 7, after an announcement by Alberta Health Services that the hospital helipad had been closed due to non compliance with regulations issues. 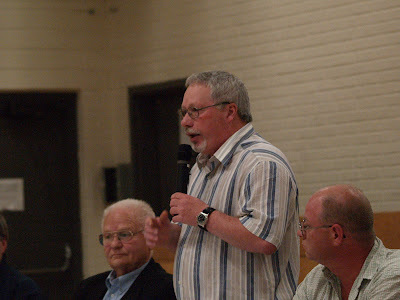 The meeting was adressed by Sundre Mayor Roy Cummings and attended by local MLA Ty Lund (left), who received some flak from the audience as the local representative for the Stelmach Government in Alberta. Six other helipads in the province, including the one serving the Royal Alexandra Hospital in Edmonton, were closed at the same time as the one in Sundre. The Sundre Hospital helipad is critical for the evacuation by STARS helicopters of trauma affected victims in West Central Alberta to intensive care treatment in Calgary. In addressing the meeting, Cummings immediately announced that the ban had been lifted as of midnight, July 7, and that local volunteers would quickly be able to address any helipad regulation issues, if required. "Don't take us for granted". 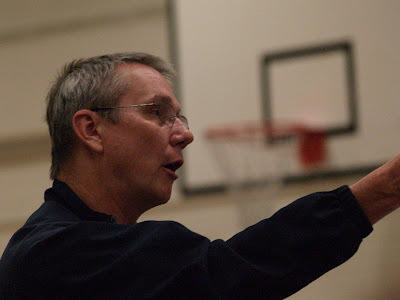 A concerned member of the audience at the Sundre helipad closure issue meeting expressed his point of view. 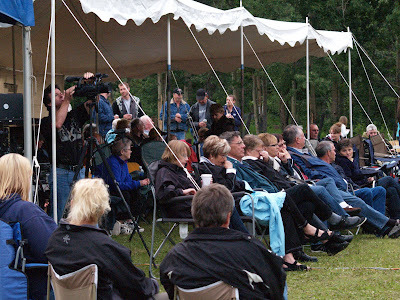 The Sundre Community Center was filled to capacity on Tuesday, July 7, with area people concerned about the closure of the Sundre Hospital Heliport by the Alberta Government. Petitions were signed to have the heliport re-opened. Persistent rumours about the possible closure of the hospital itself added fuel to the fire. 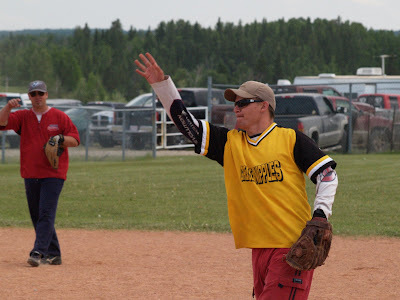 Local MLA Ty Lund expresses his frustration on being unable to track down the paper trail that led to the closure of 7 heliports associated with Alberta hospitals. 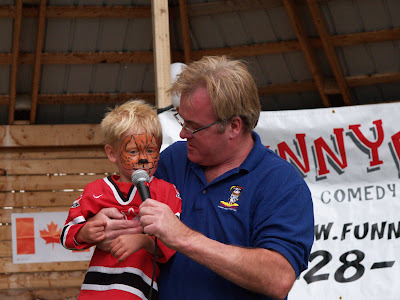 Ty Lund used to be the Minister for Infrastructure in the Klein government which preceded the present Stelmach government. The recent arbitrary closure of seven helipads at Alberta hospitals, including that of the Royal Alexandra Hospital in Edmonton and the Sundre Hospital, goes to show how things have slid out of control during the reign of Premier Stelmach and his associates. Some unnamed provincial bureaucrat evidently took it upon him/herself to issue the order based on guidelines provided by Transport Canada. However, to date, no one seems to have been able to pin the blame on anybody in particular. It is probably a classic case of “duck and pass the buck”. This is only one of a series of blunders taking place on the watch of the Stelmach Puppies. Several bills have been enacted into law that progressively transfers power away from people across Alberta into the hands of Edmonton bureaucrats, the new Alberta Health Services Board being a good example. Others include Bills 19 (The Land Grab Act), 36 (The “Walk All Over Municipal Governments” Act) and 44 ( The “Shut Up The Teachers” Act). And the latest is a private members bill to set up a Municipal Auditor's Office to do random audits of municipal books after they have already been audited by perfectly qualified auditors. And the naïve MLA that tabled this bill reportedly estimated an annual cost of $400,000-$700,000. How about trying $4 million-$7 million? At the same time the people of Sundre have been waiting for 4 years for the Alberta Government to make up its mind about restoring the Red Deer River back into its old channel before it hits the town, head on, in its next major flood. The intersection between highways 22 and 54 east of Caroline has claimed its share of victims over the the years.. Visitors were welcomed to Danish baking and tours of the museum on the weekend of July 11-12. The museum helps preserve the Danish cultural heritage in Canada and is housed in a former Danish boarding school for girls close to the Hamlet of Dickson in West Central Alberta. 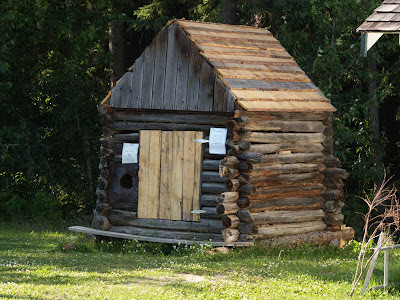 Upcoming events include the Grand Opening of the Thomson Pioneer Cabin at 2pm on July 25 and the arrival of an authentically built Viking Ship on August 22. 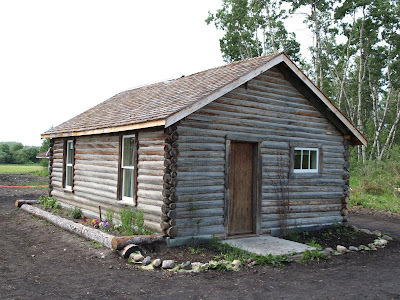 There will be a Grand Opening of this cabin on July 25 at 2pm. and Glenn Claerhout examine plans for a retirement village at the Sanctum Retreat property on the shores of the Raven River. 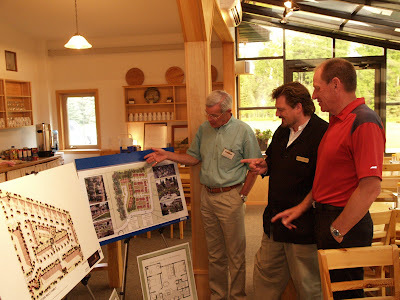 The plans were displayed at an open house hosted at the retreat on Monday, June 29. Retreat Director Kristoph Dobrowoski said that a need for this kind of accomodation in the area had been established by a market survey and developer Brian Honeywell felt that individual cottages might be the preferred option for people who are looking towards an active form of retirement. The idea of the open house was to gauge community interest and support for the proposed project. The price for a 1000 sguare feet cottage style apartment would start at $159,000. For more information, contact Kristoph at 403 722 3101. 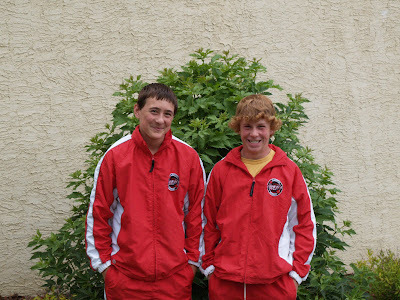 Local hockey players Cole Peters and Levi Stange are members of the Alberta Hockey Thunder Pee Wee team that will be touring Europe in August. 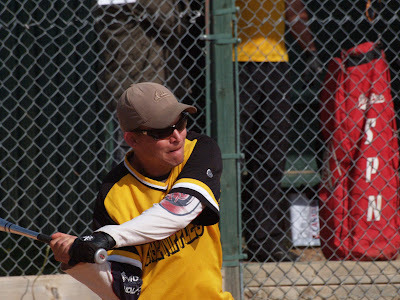 It is comprised of 12 and 13 year old boys from across Western Canada who are currently training for upcoming tournaments in and outside of the local area. 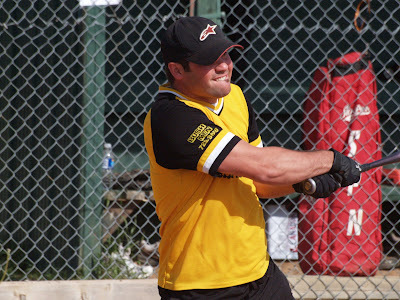 The AAA team has been invited to participate in a 20 day European Hockey Tour to compete against teams from Iceland, the Czech Republic, Germany, Sweden and Finland. During their time in Europe these boys will participate in two tournaments; in Prague, the Czech Cup and in Helsinki, the Lion's Cup. 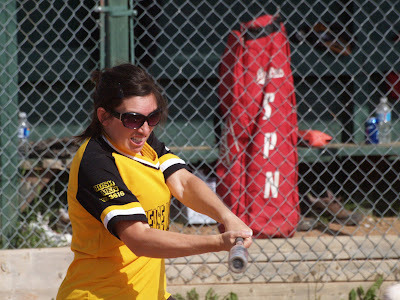 Local sponsors are needed and can contact Rachele at 403 722 3368. 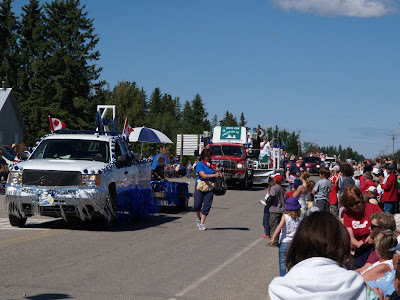 Highway 54, which is also the main street of Spruce View, was lined with people on Canada Day, July 1. 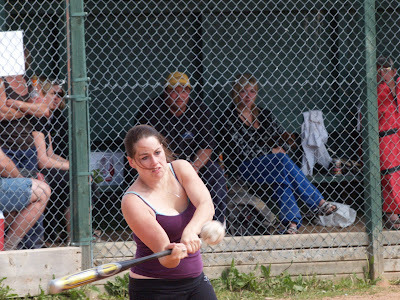 Sunny summer weather annointed the occasion. 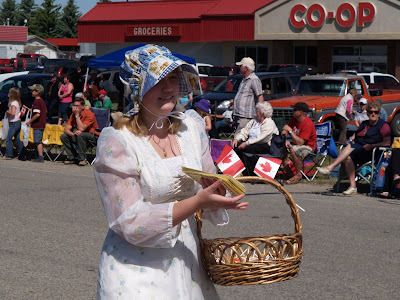 This annual parade features local individuals and groups presenting themselves to the public. I like the four seasons here north of 45 in the Northern Hemisphere. You can count on chilling out after a long summer. 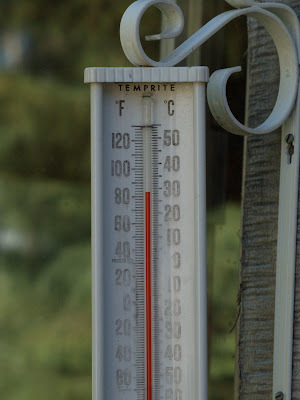 Life in the tropics of Australia for almost 20 years gives one an appreciation for some cool weather when it comes around. Also, the deciduous forest here in the north changes its dress every year, as compared to the tropical forest that scarcely changes its appearance. And the change from day to night, and visa versa, comes in an instant in the tropics, as opposed to the gentle changes in our region. Having had the benefit of growing up in the temperate region of Norway and spending time in the Norwegian Arctic, the Middle East, Australia, temperate and tropical, and now cold Canada, I can sit back and comfortably declare that east is east and west is west and home is best, as it should be for anyone who has the power to choose. I have taken some time to study the habits of my new neighbours, the local ravens and crows that have become quite plentiful since I have given them excess meat scraps from my dog food supply. Birds need a lot of energy to fly and the fatty scraps are ideal for that purpose. One interesting incident illuminates just how connected to each other these winged visitors really are: As their food supply of scraps is intermittent they get frustrated from hanging around on an empty stomach and so, early in the piece, decided to raid my pile of recyclable plastic shopping bags parked underneath a spruce tree. A bunch of these big birds, used to feeding on scraps contained in plastic bags in local population centers, made a big mess taking the pile of bags apart without achieving any culinary satisfaction. The interesting thing is that this only happened a couple of times, after which no birds bothered with it again, in spite of the fact that a large population, more than 100 birds, were involved. They obviously have a highly developed communications system, in spite of fighting and scrapping over choice pieces of meat. By and large, because of our own ignorance, we don't appreciate just how smart our black feathered relatives really are. That was not always the case: In Norse mythology, there was a close relationship between ravens and those mythical people that were half god, half human and mixed with mere mortals at their pleasure. When needing to travel quickly, or listen in on conversations meant to be private, they would routinely turn themselves into ravens so as to be able to move about freely. by the government surveyors that planned the town site some 100 years ago. 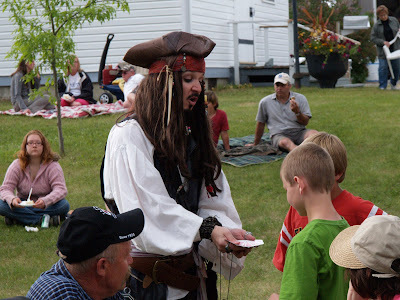 The occasion was celebrated in the Sundre Historical Society's museum grounds with a free meal and entertainment for young and old. 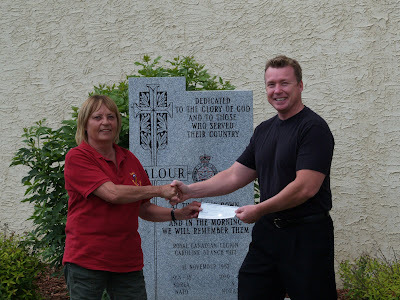 Legion President Pirkko Van Dijk presented a cheque to Memories Recovered Project Producer Allan Cameron. This project consists of recorded audio/video interviews with war veterans who tell their personal stories of experiences during military service. Several veterans were interviewed in the Caroline area. 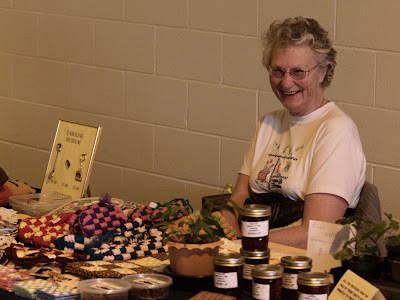 Jennifer Larsen from the Caroline Museum sold items to raise funds for the museum last Friday at the weekly Farmers' Market in the curling rink space at the Caroline Complex. 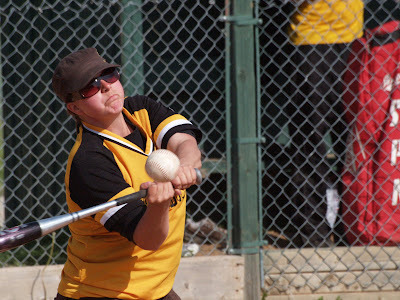 Bobbi Seemann, Wayne Seemann, Shane Nafziger, Lorissa Nafziger, Candace St.Hilare, Kirsten Collison, Marty Umsheid, Janelee Petersen, Cody Smith, Tyson Dezall, Keith Vandermeer, Chris Paradis, Kyle Collison. 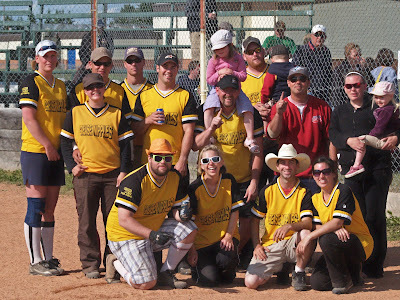 The team took top place in a 16 team tournament on the weekend of June 26-28 at the Caroline ball diamonds. 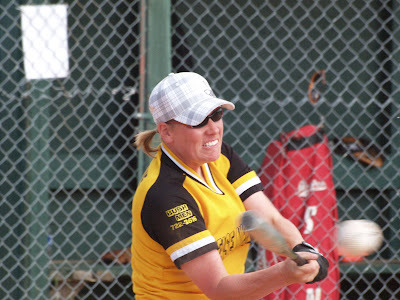 Money raised at the tournament are given to local charitable causes. 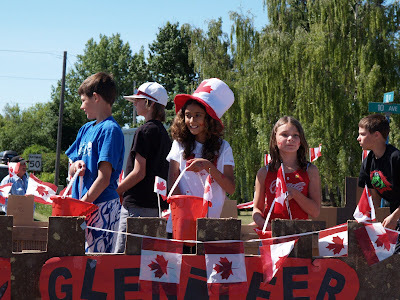 It was a weekend of fun and games in perfect summer weather and a large turnout of people. 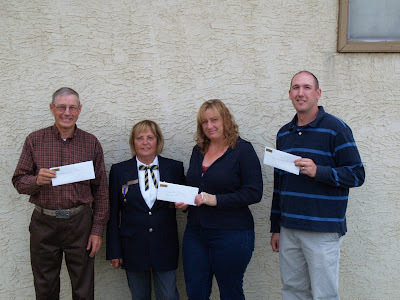 Helge Nome, P.O.Box 354, Caroline, Alberta, TOM OMO.